Click here to read more about reportage possibilities for managers. The Leavedays application offers the possibility to create multiple kinds of reports containing the data in the system. Below are short descriptions of the different kinds of reports. You can read extensive information about each report when you select the name of the type of report. 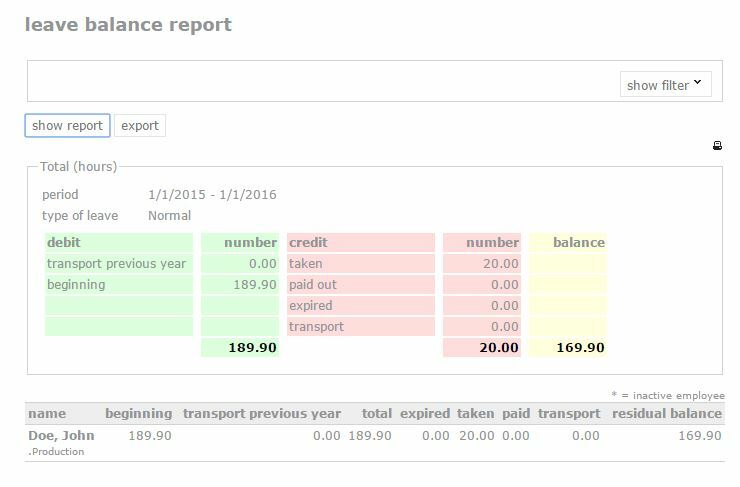 In a leave balance report, an overview can be generated of the remaining leave balance of a certain type of leave or the balance of all types of leave together, of one or more employees. It might be necessary to generate a report at the end of the quarter or the year. When a report is created containing all employees, a summary is presented at the top, and the individual employees’ information is given underneath. This overview can be printed or exported to an excel file. The overview above will be shown, containing the selected information up until the selected date. This overview does not show which leave was taken at which time; this can be requested in a different report. This report of a selected period can show, for either one or all the employees, an overview of one or all types of leave that have been selected. This overview also contains the date of the request, the type of leave, the number of hours, the person who authorized the report, and the status of the request. This report could be useful when you need to know the number of illnesses, or who requested leave for a doctor’s visit during the selected period. This report of a selected period shows, for all employees or one department of the company, the total number of hours requested per type of leave. This differs from the request summary because it shows the total number of hours for the selected variables in the selected period. This report does not, unlike the request summary, show when the leave was taken (refer to the request summary for this). This report shows a monthly overview of all the employees that have left the company in the month in question. Especially in big companies, it might be very useful to print one of these regularly. Furthermore, by doing this, the Leavedays system will also stay up to date. As soon as the employee’s contract expires, the employee’s account has be deactivated manually. This allows a license to open up for a new employee. This report shows the amount of leave that was added and deducted per type of leave in the selected period. It can be requested per employee, for all employees, or an entire department.